BoldGrid has an impressive feature built into it called Staging. Staging allows you to create a separate site from the main “live” site (also known as the active site). This development site would be referred to as your Staging site. Your staged site can be a duplicate of your active or live site and where you preview changes before the public sees them. The staged site can also be a completely different version with all new content a new look and feel. This can be switched out with your active site when you are ready. The goal of this article is to explain the differences regarding active vs. staging environments in BoldGrid. All of your content, whether on the live site or the staging site, is viewable within the Pages list. Take a look at your Pages list and you will notice there is a column named Development Group. There are two types of Development Groups: Active, and Staging. 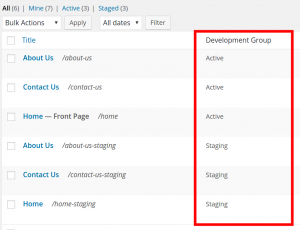 Any page within the Active development group is on your live site while any page within the Staging group is in your development area. You can edit any page, no matter what group it is in. When creating a new page, you will have the option to set it to Active or Staging. 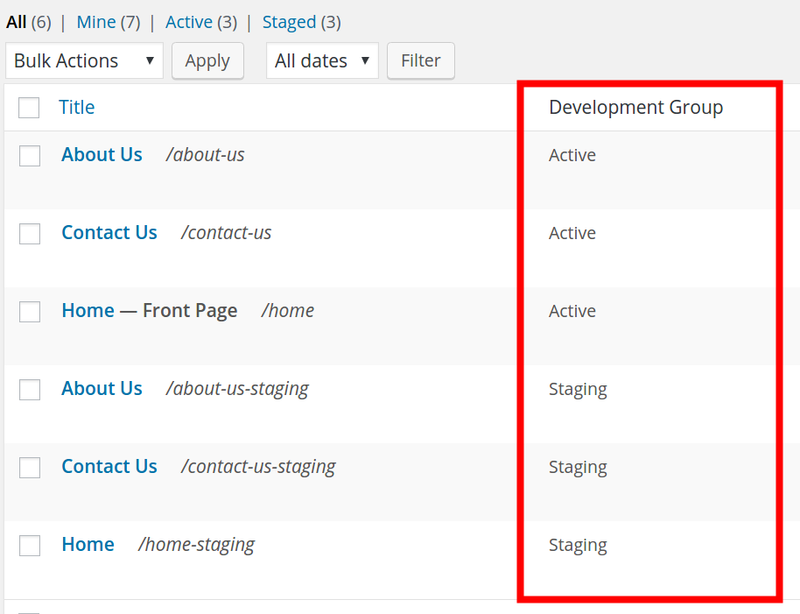 Under the Publish settings in each of your pages, you will notice a setting for the Development Group. Here you can select your preferred group by clicking the radio button of your choice. Keep in mind, if you click the Publish button without selecting a Development Group setting, it will default to the Active group. Themes can be set to Active or Staging as well. When visiting the themes page in your dashboard, each theme will have options called “Activate” and “Stage”. The Themes that are set to Active or Staging are also displayed in the preview thumbnails. Note that you can set each theme to Active or Staging by clicking on the Stage or Activate buttons. You can also remove a theme from Staging clicking on Unstage.